Tools are made and born are hands. These are freedom of creativity, neatness, thriftiness, duty, cleverness, portability, fullness and satisfaction, orderliness, accomplishment, and time. Each is complete unto itself, so there are scissors in each basket that needs them, for example. 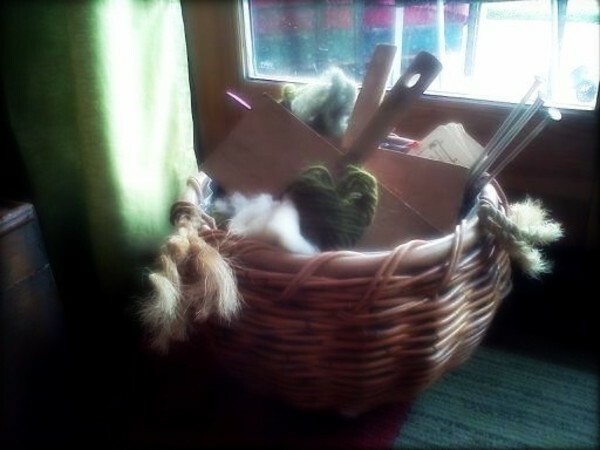 A basket can be put up and away, taken into a field, closed against curious little fingers and taken to bed or into a car. They are harmonious with the room, visually neatening it, confining a vast multitude of objects into a few pleasing shapes. They are maneuverable, none too heavy to be lifted easily to a high shelf or carried across a meadow. They give the gift of a project worked over time so little momentum is lost with interruption and hand work is lightly taken up again even after a long delay. Small efforts are gathered and effortlessly turn a few stitches now and then into mittens. Time is not spent searching for pieces or tools and everything needed comes readily to hand. They are womanly, connecting you through time to the millions of women who made what was needed for themselves and family. And they are peace and self, moments of creating, fixing or mending, breathing, touching and seeing. Making — the devil’s bane in a basket.